Be sure to pull out those calendars and save the date for The Olde Farmhouse Vintage Market! 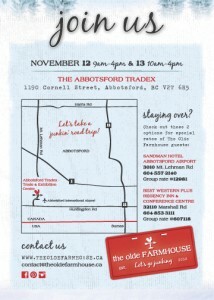 November 25 and 26, 2017 at the Tradex in Abbotsford, BC is where you are going to want to be, to hunt for all things vintage, repurposed, upcycled, refinished and handmade. You will find home decor, collectibles, antiques and farmhouse treasures galore! 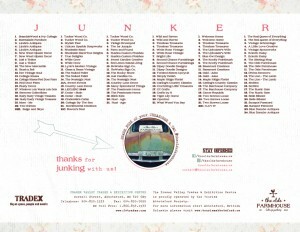 We hope you can join us for a great weekend of Junking! Be sure to follow The Olde Farmouse on Facebook for all the up to date market info! 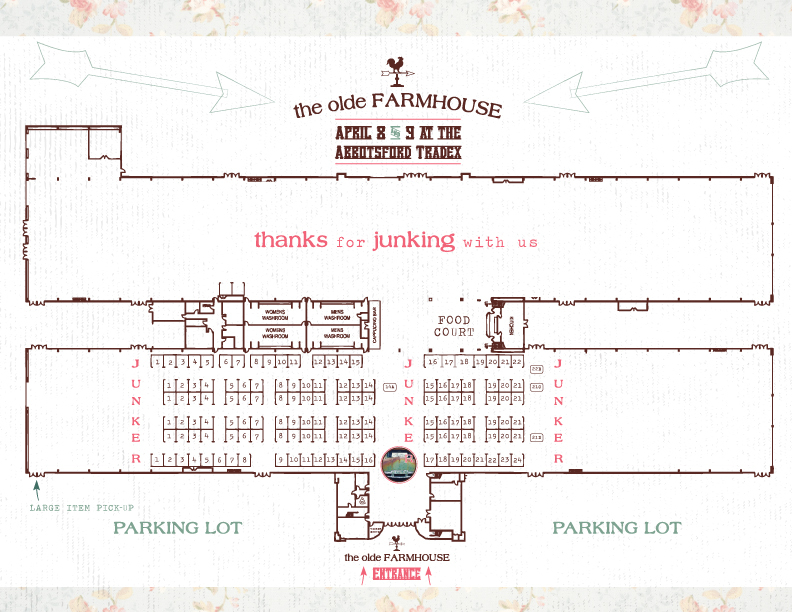 The Olde Farmhouse Spring 2017 Floor Plan & Vendor List!! 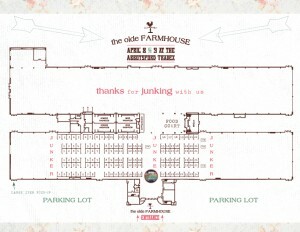 Just to get you a little more excited….here is the floor plan and vendor list for the market next weekend!! Yipppee!! You can print this one off, or pick up a copy upon entrance. It’s a great reference for market day, or even after! When you get home your head will be swirling, so you can always look back at the map if you are trying to remember a vendor. I am so excited for the next Olde Farmhouse Vintage Market on April 8 & 9th at the Tradex in Abbotsford, BC!! 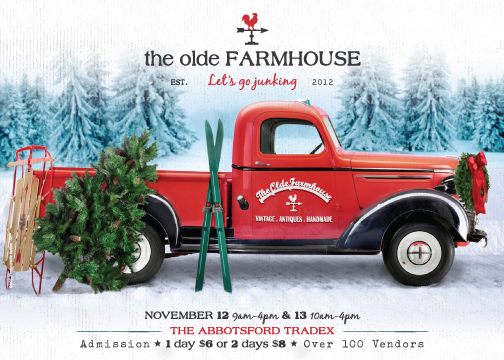 Over 90 vendors will be gathered to bring you some amazing, one of a kind finds! Over the next few weeks, take some time to browse the list of vendors (along the right hand side) and visit their sites. You will get a sneak peek at what they are working on for the spring market. It will be a great weekend to jump start your spring gardening, organizing your home and doing some spring time decorating! Stay tuned for some events leading up to the market…we will be having our legendary Facebook party as well as chances to win some fabulous prizes on Instagram! 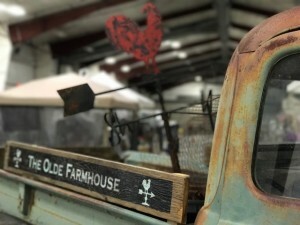 Let’s Go Junking at The Olde Farmhouse! It’s that time of year again! The Olde Farmhouse Vintage Market is happening November 12 & 13th at the Tradex in Abbotsford, BC. There will be 125 vendors with some amazing treasures! It is the perfect opportunity to do a one stop shop for that perfect, one of a kind find. Come and spend the weekend with this group of talented vendors…you are sure to find something special for you, your home or for someone on your Christmas shopping list! For more information you can always visit the Facebook Event page. I will also be posting more information here, so make sure you keep checking back! In the mean time, start browsing through the vendor links along the right hand side of the page. You can start your wish list early! Wow! 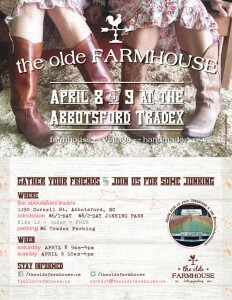 What a wonderful weekend at the Let’s Go Junking at The Olde Farmhouse! If you had a chance to stop by, you know just what I am talking about. The vendors spent countless hours preparing for this market and the end result was spectacular. 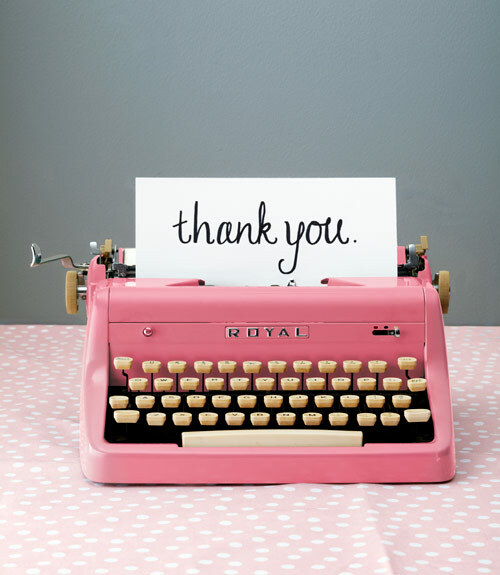 Thank you to each of the farmhouse family vendors for creating an amazing shopping experience for our customers. You out did yourselves! 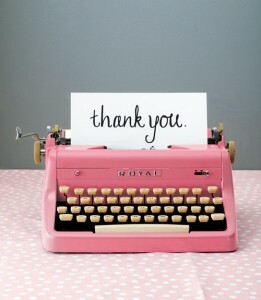 I would also like to extend a big thank you to all the customers who came to shop local. It is so much fun watching you find that perfect treasure, reliving memories, hanging out with family and friends…the whole weekend had a feeling of happiness and that has always been my goal with this market. Bringing people together for a weekend of fun. I could never do this market without the support of my amazing family. My husband Tom and my children Spencer and Allison turn family holidays into junking trips and never seem to mind! The couple of weeks leading up to the market, they always do whatever they can to help out and deal with the craziness that consumes our house. I feel so lucky to have them by my side and appreciate all that they do to help make the weekend go by so flawlessly. I am one lucky wife and momma!! Nothing can make a girl feel more special than to be surrounded by people she loves. This feeling overwhelms me at every market. Thank you never feels like enough, but it is a start! Barb, Dawn, Deanna, Jen, Dana, Glenn, Marcie, Hayley, Eileen, Melissa, Brad, Sheron, Robert, Leslie, Larry, Bertie, Sue and Leslie you guys are rock stars! You help the weekend unfold without a hitch and your smiles and help go a long way! To my beautiful sister Tanya and niece Samantha, thanks for making the drive from Alberta to be with us. 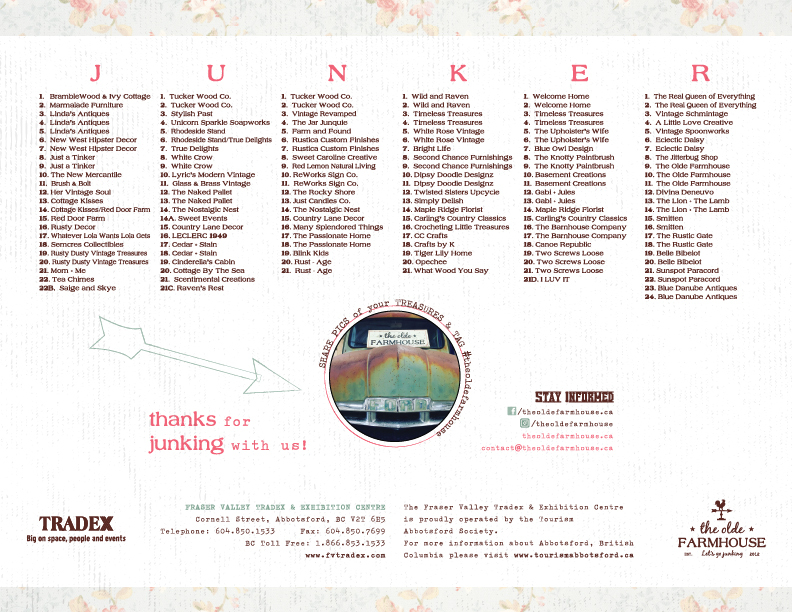 The market wouldn’t be the same without you there Tan, and I love that we have the joy of junking to share together! Life is short and being able to take these opportunities to keep creating memories together is what it’s all about! Mom and Dad…thank you for being who you are. You support me unconditionally and always jump at the chance to help. You have been my role models all my life and I hope you know how grateful I am to have you as my parents. So as another market wraps up there is only one thing left to do…start Junking for the next one!!! 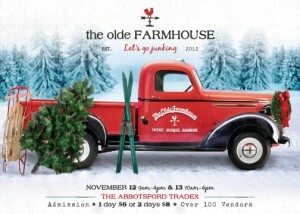 See you all November 12 and 13th for The Olde Farmhouse at Christmas!